There are many images that plays in my mind when I think of the past week in Malaysia. Without doubt the image of Allahyarham Baharuddin haunted me constantly. Like those who had suffered under the ISA, those that had died while under MACC and PDRM’s custody, those multiple deaths in bus accidents which could have been avoided if the authorities were more vigilant in their enforcements, like Altantuya…these death were unnecessary. These deaths would not have happened if we had had a more compassionate government.Allahyarham Baharuddin did not need to die. He said Anwar ’s injuries could have been selfinflicted to give him an excuse to discredit the government and the police. “Anwar should be given an Oscar for making what is not true look like the truth. We expected him to twist the facts to suit his goals,” Muhyiddin said after attending the national-level Gawai Dayak open house at Rumah Wilson Begat Anak Bakir, in Penom, Ulu Paku, here. These are comments and reactions we expect from those watching stand up comedy or during teh tariks banter at the mamak stall with friends – not from our PM and DPM. That these comments came into the public domain merely compounded the callous display by these BN leaders when images of Allahyarham Baharuddin are still vivid in our minds. But then this is the manner by which UMNO leaders who are out of touch with their own people’s plight and suffering display their “leadership qualities” when in front of their own self serving menagerie of animals wanting to be entertained. Any UMNO crowd gathered at PWTC certainly wants to be entertained and reminded of their “destiny to rule” – and this time around, even without the supporting act of Din and his Keris, Najib did not disappoint them. If anybody deserved an oscar, it is Najib! Now watch this clip from that event. 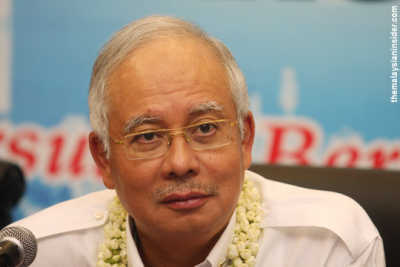 Najib proclaims that UMNO “akan bangkit dari peristiwa ini”…a tacit acknowledgement that UMNO has indeed been affected adversely by the events of the past week. It saddens me that this Prime Minister of ours regards the ISA as a weapon to be used against opponents of UMNO…NOT against any threat to National security, but any opposition against UMNO! …an undisguised admission that Malaysia belongs to UMNO! And this is Prime Minister of 1Malaysia? An arrogant man out of touch with the realities of a world that is slowly but surely crumbling around him.But cocooned within UMNO’s abyss he unwittingly considers his seat of power safe and secure from the relentless advance of his own people who have had their fill of a corrupt and arrogant UMNO! Much as I recoil from watching these sad images of our PM and DPM making fools of themselves I cannot forget that with power and money they can still yet cling to power. It is imperative that we continue to remind ourselves and others amongst us, that the 13th general election is a time for change. Bersih 2.0 is now behind us. Lessons learnt from this Rally is already making its way into our consciousness. We are stronger and more resolved in preparing ourselves for the coming 13th general election.But we must remember this- when your enemy is in your range, so are you in his range. UMNO and PDRM too will have learned from these events. They too would now be better prepared for what is to come in the 13th general elections. When all is said and done it is the people’s vote that matters. We need the numbers – the critical mass – to win change. Talk to those who are still on the sidelines of change. Talk to those who are still unsure what change will bring to our country. Talk to those who are already with us and enlist their help to win over others to our cause for change. If we do these diligently then God will no longer be on the side of those with big armies and bigger purses. HE will be on the side of right! You are one. With me we are two. Come join us. pope : " welcome , ALL sinners !